MTK SP Multi Port Tool is an application that allows you flash firmware, format bootloader and delete NVRam Backup etc. on Android devices. It is a powerful tool for all Android devices, but you can use this tool when your phone USB driver is installed on your PC. What is a MTK SP Multi Port Tool ? MTK SP Multi Port Tools is an application to make bridge or connection between Android Smartphone and PC. And by this connection, you can easily flash Android Stock ROM, Format Bootloader, delete NVRAM Backup, Auto detect your device and other features. 1. Flash stock Rom: You can flash Stock or Custom ROM, update your Android devices and most important unbrick your Android device by using MTK SP Multi Port Tools. 2. Format BootLoader: This tools allows to format or delete bootloader. 3. 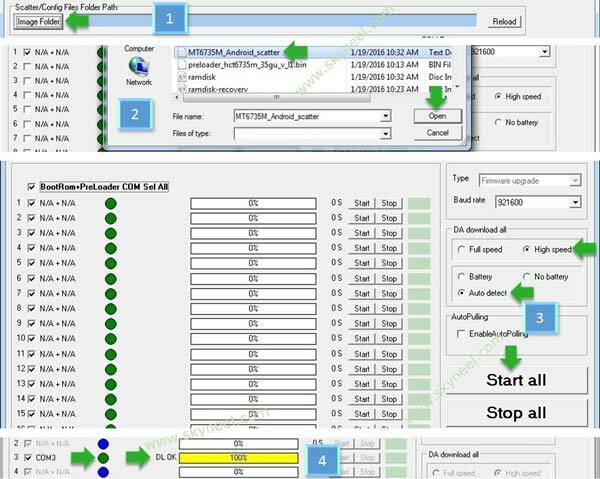 Set flashing SpeedKernel: By this option you can set flashing speed on your Android Smartphone. 4. Detect your Android Device: MTK SP Multi Port Tool allows you to Autodetect your Android Smartphone with and without battery. 5. Other Features: This tools is allow you to delete NVRAM Backup data and remove OTP lock for your android device. Step 1: Download and install your phone USB driver on your PC. Enable Developer Mode and USB debugging mode on your Smartphone by this guide. Step 2: Now download MTK SP Multi Port Tool and Stock Rom file and extract both zip or rar file in desktop. Then double click MTK SP Multi Port Tool and open it. Once MTK SP Multi Port Tool is open, you able to see following windows. 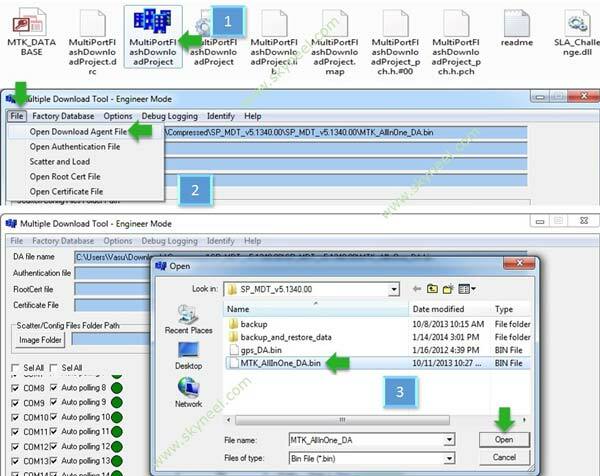 Step 3: Now click on File Menu and select Open Download agent File, Now locate the MTK_AllinOne_DA.bin file from MTK SP Multi Port Tool folder. See in the image 2 and 3. Step 4: Click on Scatter file (Image Folder) button and choose scatter file from Stock Rom folder. Now tick on BootRom +PreLoader Com Sel All. Now click on Start All Button to begin the flashing process. see in this image. Step 5: Now boot your phone into Fastboot Mode, So switch off your phone and remove battery. After then press and hold volume up key and connect USB cable. Once flashing process complete, you will see Green DL OK. See in the image 4. I hope you get your desirable MTK SP Multi Port Tool version. You can easily install it and flash your ROM and custom recovery. If feel any problem in this guide then please use comment box. Thanks to all.